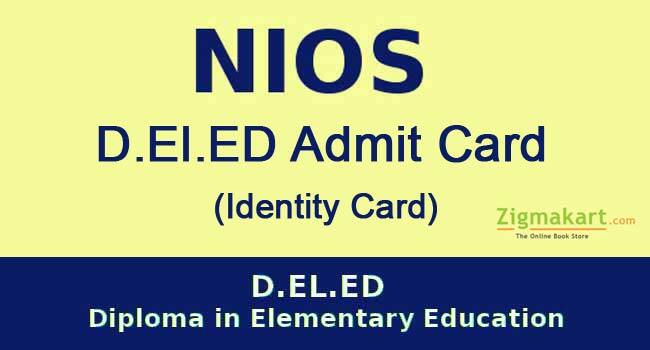 1.1 How to download NIOS D.EL.ED. Identity card? 1.3.1 Whether to take color printout or black and white? 1.3.2 Getting a different person’s photo on my admit card? 1.3.3 NIOS DEL.ED. Identity card has been misplaced? What to do if the D.EL.ED. teachers are unable to login? Teachers don’t know user id and password. Teachers unable to reset the password. Whether to download the ID card in color print or just a black and white? How to update photo, if there is a different person’s photo on ID card? What to do, if the D.EL.ED. card has been misplaced? Well, in this article all these questions are answered. You can easily download your NIOD DELED ID card by using computer, laptop or with smart phone. It will be identity card for all untrained teachers who are pursuing D.EL.ED and is valid for the next 2 years. It has personal details, NIOS instructions and detailed D.EL.ED. subjects. How to download NIOS D.EL.ED. Identity card? In order to download the NIOS identity card you need to provide the same email and password, which you have shared at the registration time. We will also share the solution for the situation, where you are unable to locate these details. Firstly, you need to visit the teacher login section on the NIOS official website. Now it will redirect you to another page. Please enter the email/ mobile number and password you have provided at registration time. With these credentials you can will be successfully logged in to your account and easily able to see your details and other information. Just below these details, there will be an option to Print Your Identity Card, you need to click it. By clicking on the Print Identify Card option, you will get a print view of D.EL.ED. admit card. If your printer is connected with computer and laptop, then you can directly print the NIOS D.EL.ED. admit card. By using screenshot option save the admit card, if there is no connected printer. You can also save the complete webpage by pressing Ctrl+S from the keyboard. However, with the Chrome browser you can download this to your mobile. Note: Principal and the student need to sign the D.EL.ED. admit card on mentioned area. The main reason for this situation is the wrong email/ mobile number. Try to remember the details you have shared in the past. Check all of your email inbox for the NIOS registration mail. Click on ‘forgot password’ button if you don’t remember it. It will take you to another page where you need to enter the registered email. You might get invalid email or mobile number notification, which means that you are not entering the valid details. However, entering the correct email will provide you a link to reset your password. Whether to take color printout or black and white? There are no clear instructions by NIOS for printing the admit card. However, it is advisable to take color printout. Getting a different person’s photo on my admit card? This can be because at time of registration you might have upload different person’s photo by mistake. The correction for this can be only done by sending an email to NIOS at [email protected] along with your correct details and photo. You can also contact and send a copy to the State NIOS Nodal Officer. NIOS DEL.ED. Identity card has been misplaced? You can download more than one copy, as the link will remain active for many days. After closing the link, you need to contact NIOS for a fresh copy. Feel free to contact us for any other D.El.Ed Identify Card related concerns. i have received my enrollment number but cant take out the print of admit card. kindly guide. When I had provided the date of birth it says invalid..so I cannot print out my admit card for the DElEd exams.. what should I do sir? ?